_ HOW LONG DOES IT TAKE TO GET A DIVORCE? Once a petition for Divorce is filed, if you have minor children there is a mandatory ninety (90) day waiting period before the Divorce can become final. There is a procedure to ask for a waiver of the 90 day waiting period for good cause shown and if both parties agree to the Divorce. If the Divorce is contested, then it could take several months to a year before the case goes to trial. Some cases, depending upon complexity, can take over a year. It is difficult at the outset of a lawsuit to foresee how long it will take to complete. We are better able to give you an estimated time range later when we understand more clearly what is at issue. The time involved is primarily based on the number and complexity of the contested issues. Additionally, a factor that makes lawsuits last longer is the intensity of the feelings between the parties and how much they want to fight. Mediation can often help settle a highly contested Divorce case. We begin the work on your case when we are retained after your initial consultation. If you decide to start the divorce, we first draft a Petition for Divorce, a Summons and Automatic Temporary Injunction, and usually an Application for Temporary Order. These documents are given to you for your signature and approval before filing. 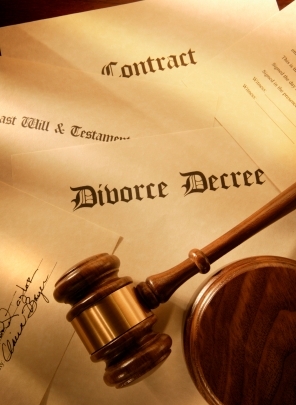 You can request the documents be served on your spouse by a Process Server or by Certified Mailing. After service of the Petition, the law provides a specified period (20 days) for your spouse to answer. The court or an agreement between attorneys may extend this period. The first court date is generally a Temporary Order hearing. WHAT IS A TEMPORARY ORDER HEARING? Until the trial is scheduled, the court must make temporary orders about custody, child support, spousal support, marital debts and property division. During this hearing, we ask the court to decide issues such as: visitation, custody, who will remain in the family resi­dence, who will have control of certain assets (like a car), and who will be responsible for certain debts. At the Temporary Order hearing, the dependent spouse presents evidence of his or her needs, obligations, and expenses. The spouse from whom support is sought will present evidence of his or her expenses and income. It is very important for us to prove facts about the parties’ income at this early stage. Therefore, you will need to provide us with any written evidence about these matters. Preserve and deliver to us such things as pay stubs and tax returns so we may have as complete a financial pic­ture as possible. A Temporary Order hearing can only be held for a Divorce case. There is no Temporary Order hearing for a post-Divorce Motion to Modify or Contempt Citations. WHAT HAPPENS AFTER THE TEMPORARY ORDER HEARING? After the Temporary Order, your attorney will schedule the case for a Pre-Trial Conference and a Trial. To prepare for trial, the parties are permitted to conduct discovery. During this stage, both sides try to collect all the information necessary for set­tlement discussions and/or trial. Discovery refers to the ability of both parties to get information relevant to custody and financial issues from the other side. Discovery includes such devices as interrogatories, depositions, and requests for documents. Usually interrogatories are first and then a deposition may occur if additional information is necessary. This proceeding involves the taking of sworn testimony from you, your spouse, and/or third parties at one of the attorneys’ offices. Usually both clients, both attorneys, and a court reporter are present. Discovery is a two-way street, and each side must produce documents and records and respond to questions, etc. It is always preferable to approach these mat­ters in a spirit of cooperation with opposing counsel. We find that this sort of cooper­ation reduces the time required for the discovery phase of your case. In many instances it also substantially reduces the cost to you of that phase. It is, therefore, our practice and desire to try to get all the information that we may need on an informal basis. However, this may not be sufficient. Under such circumstances we must resort to the procedures provided by law in legal adversary proceedings. You are allowed to settle your case at any time, and a mediation may be helpful in this regard. WHAT INFORMATION DO WE NEED TO PREPARE YOUR DIVORCE CASE? A complete picture of the assets and income of both spouses is absolutely neces­sary. By providing us with the information and documents requested below, you will help us in the preparation of pleadings and doc­uments required in your case. In addition, possession of these documents will help in preventing your spouse from dissipating or secreting any assets. 1. Income Tax Returns. Completed personal, corporate, partnership, joint venture, or other income tax returns, state and federal, including W-2, 1099, and K-1 forms, in your possession or control for the past 3 years. 2. Income Information. Current income information, including payroll stubs and all other evidence of income since the filing of your last tax return. 3. Banking Information. All monthly bank statements, passbooks, check registers, deposit slips, canceled checks, and bank charge notices on personal and business accounts, certificates of deposit, and money market and retirement accounts from banks, savings and loan institutions, credit unions, or other institutions in which you or your spouse has an interest. 4. Financial Statements submitted to banks, lending institutions, or any other per­sons or entities, which were prepared by you or your spouse at any time during the last five (5) years. 5. Any Loan Applications made within the last five (5) years. 6. Pension, Profit Sharing, Deferred Compensation Agreement, and Retirement Plans or any other kind of plan owned by you or by any corporation in which you or your spouse has been a participant during the marriage, including annual statements. 7. Life Insurance or certificate of life insurance policies now in existence, insuring your life or the life of your spouse, and statements of the cash value, if available. 8. General Insurance. Copies of insurance policies, including, but not limited to, annuities, health, accident, casualty, motor vehicles of any kind, property liabil­ity, including contents. 9. Outstanding Debts. Documents reflecting all debts owed to you or by you, secured or unsecured, including personal loans, credit card statements, and law­suits pending or previously filed in any court. 10. 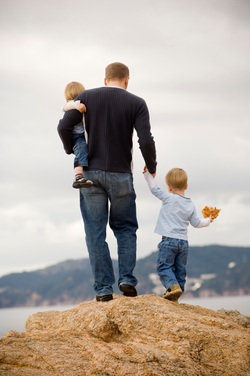 We will need additional information relevant to a custody dispute, and our legal assistant will provide specific instructions for you after your attorney reviews your case. ARE YOU SURE YOU WANT TO FILE FOR DIVORCE? In Divorce actions, if the topic of reconciliation arises, we are not questioning or judging your deci­sion with respect to the divorce. We encourage clients to explore alternatives, and we are supportive of your decision if you do not wish to pursue a divorce. If you do not wish to officially dissolve your marriage, you have the option of a legal Separation. Orders can be made for custody, visitation, child support and property and debt division without actually terminating the marriage. The Oklahoma Bar Association publishes a very informative brochure on Divorce. Click Is Divorce the Answer For You? for additional information on Divorce in Oklahoma.